Another great review from Kathy & Tracy from California, US. 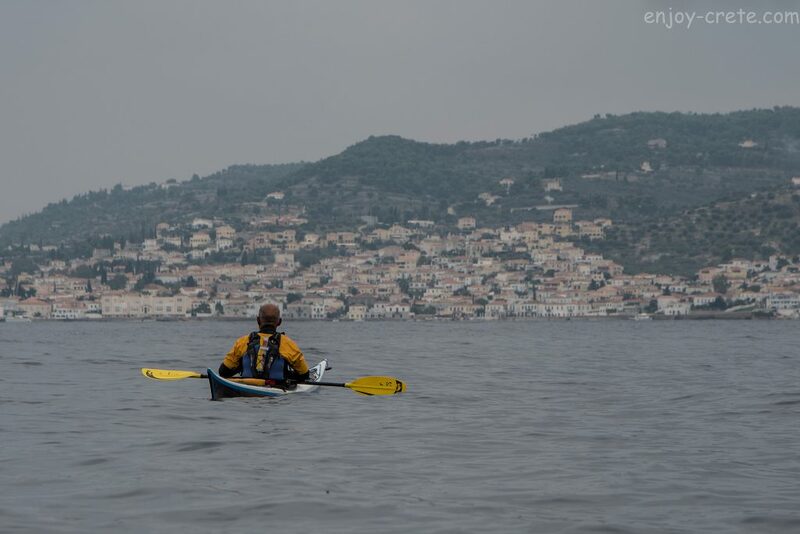 The review is about our latest sea kayaking trip (6 days) in eastern Peloponnese that took place late October 2018. Photos taken from Enjoy-Crete. The complete set of pictures can be found & download on our Flickr account in this link. The second part of our trip in Greece was with the outdoor adventure company, Enjoy-Crete, run by our friend and guide Stelios Asmargianakis. 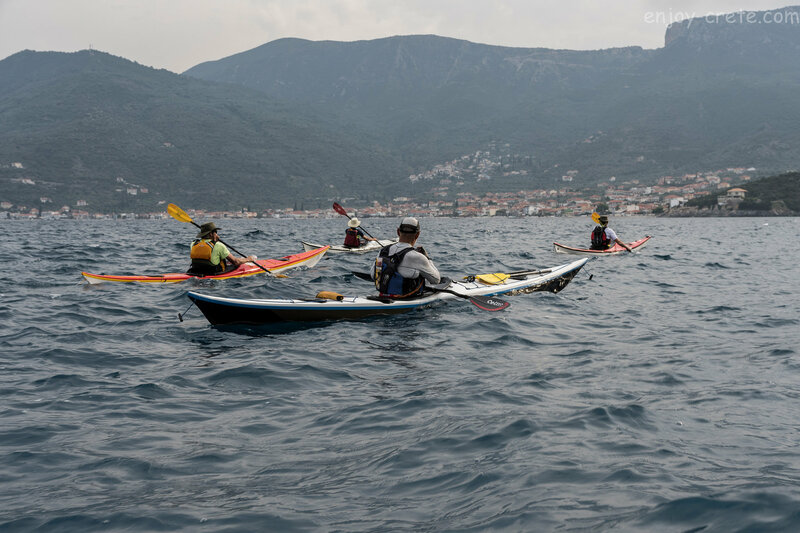 We signed up to go on the Sporades trip with Stelios, 6 days of sea kayaking and camping around Skiathos, Skopelos and Alonissos, also known as the Mama Mia Islands. But once the group joined together in the Athens port of Piraeus we got the news that the weather forecasted high winds and big seas for the Sporades, so after talking over options with Stelios and his guide friend, George and the two other paddlers from Poland and Luxembourg, we decided to head to the eastern coast of the Peloponnese. 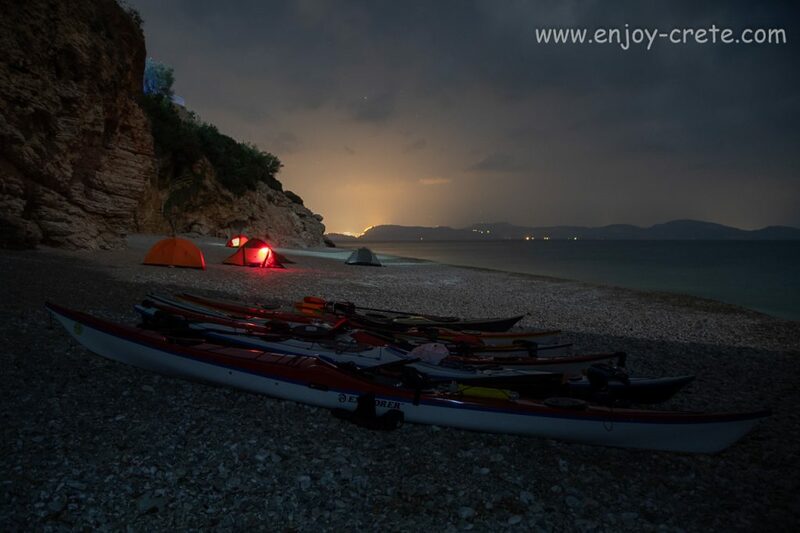 Our first day camping spot with light pollution from Nafplio city. We departed from the popular port city of Napflio near the Argolic Gulf and headed southward, hoping in 6 days to reach the fortified medieval town of Monemvasia. This part of the Peloponnese coast has beautiful stone beaches and quaint coastal villages that are dwarfed by lofty limestone mountains. 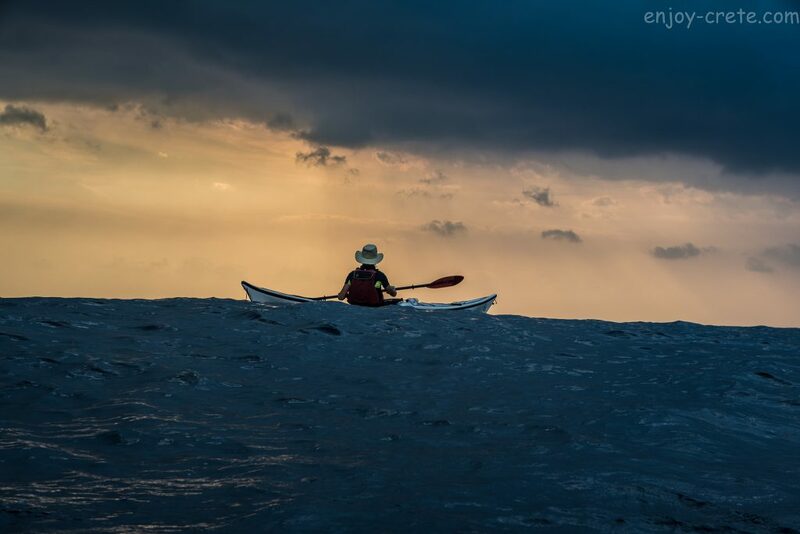 We had it pretty easy the first several days of paddling with a following light wind, allowing us to go long distances each day and pull into deserted beaches to camp at night. But recent rains caused the hatching of swarms of mosquitoes,so after the first night of cooking on the beach, everyone conceded that the mosquitoes were unbearable and save for our last night, we ate dinner out at nearby village tavernas. We dined on fried calamari, zucchini, eggplant, grilled halloumi and so many more Greek delicacies at a very small cost. I really enjoyed our walks through these villages, the company at dinner and the peaceful nights on the beaches in our tents. Stelios’s sense of humor shined through the whole trip and George’s knowledge of the sea and his bellow “The sea is not dangerous. 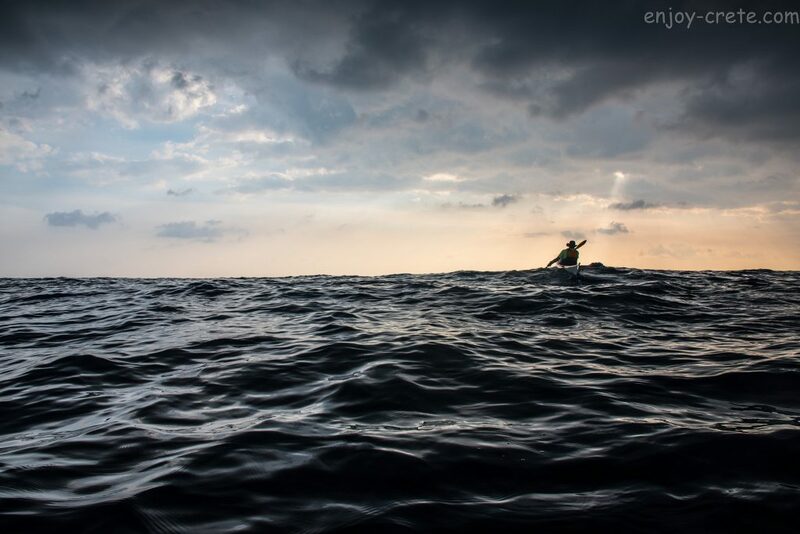 It is the land that is dangerous!” is hard to forget and so is the friendliness of our fellow paddlers. I could repeat the whole trip as it was, all over again. Back to our adventure. Out on the sea, I was surprised to see schools of flying fish(yes, flying fish), something I had only read about. This coast was more wild than some parts of Greece, so there were more birds and many Comorants, which never failed to escape from their perches at the sound and sight of us. One Comorant did a comedic noseplant into the water to avoid colliding we me. Poor thing, but he managed to recover albeit a little chagrined. We spotted a few Herons at first, until we suddenly came upon literally hundreds along the shore, up on the rocky cliffs. Once we saw the fish farm, the wall of Herons made sense. We also caught sight of just one sea turtle. They like to rest on the surface of the water looking like large floating rocks,but quickly disappear once they catch sight of you. It wasn’t long before the weather changed and on the third day the winds that we had anticipated would push us south changed and waves began hitting us from all sides.They weren’t large waves, but progress forward was slow and there really was no end to this and no way of escaping them farther in or farther away from shore. These waves continued to slow us down the morning of the fourth day as well, a day we had hoped to paddle 40 kilometers so that we would reach Monemvasia in time. After we came on shore at a small village for a Cappuccino break, the guides checked the forecast for the following days. And it wasn’t good. The waves would keep coming at us from all sides,only stronger. So we thought up a new plan to drive north and circumnavigate the island of Spetses, closer to Athens in the Saronic Gulf. The cars were 3 hours north from where we left them in Napflio, but that didn’t seem to deter our guides and that afternoon, after a fun morning playing in the boats, practicing rescues and rolls, they left via a friend’s fruit truck. While they were gone, we began sorting out the food we no longer needed and hadn’t needed, to lightening our boatload. Outside of a residence, walked an elderly greek woman to whom we offered some fresh vegetables as we sorted. But we continued to uncover more unneeded unused food and she walked by us again, each time only able to carry so much. Well, she kept walking by and we continued loading her up with food. In the end, she kissed us both on our cheeks. That night we slept on a peaceful beach just below the village and didn’t see our guides until early the next morning. We hurriedly loaded the gear and boats and drove off up into the Parnon Mountain Range, forested with Pine, Juniper, Fig and Chestnut intermittent with steep limestone rock walls that glowed various colors through the mountain fog whenever the sun hit it. The views of the coast and sea, clear from above were spectacular as we drove through the high mountain passes and it was a bit hard to imagine us being so far down in that vast sea, probably looking pretty tiny to any passerby. It was a long drive north and hours later, but we launched our reloaded boats from the town of Kosta, out on the thumb of the hand of the Peloponnese and paddled across to Spetses, careful not to get in the way of the ferries and not attract the attention of the Coastguard. We made it northward along the coast and around to the far side of the island before pulling into camp. That night we pitched our tent up from the beach on a covered patio of a closed taverna, away from mosquitos and protected from a possible impending rainstorm. We got up in the dark the next morning, our last of the trip and paddled south around the end of the island and then north up to the main village of Spetses, home to the19th Century female Greek war hero and Navy Admiral, Laskarina Bouboulina, who fought during the Greek War of Independence. We arrived in the rain and took refuge at an outdoor cafe to drink our ritual Cappuccinos and Greek coffees, but the rain kept us from venturing much beyond a stroll along the port. Once back on the mainland we prepared for the long drive back to Athens and eventually to our homes in Poland, Luxembourg, Crete, Athens and California.